It’s true to say that over the years, my love of sea-life and seafood has been enhanced consistently by certain publications and their authors, whether concerning natural history or culinary notes. 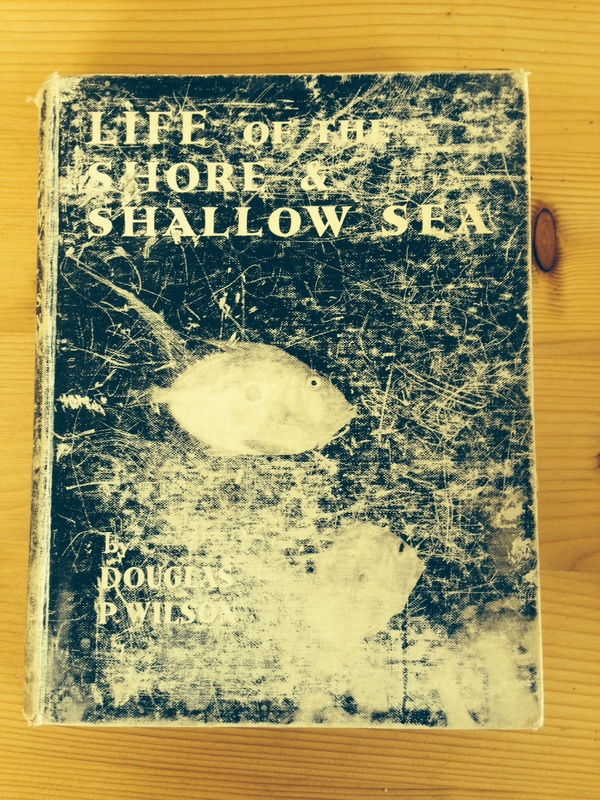 One of the first books that I drew inspiration from was one of Father’s favourites which I still read to this day, namely “Life of the Shore and Shallow Sea” by Douglas P Wilson. The original version was printed in 1930 and my Aunt gave this particular copy to my Father in 1935, on his 13th birthday. Although printed with plates in black and white, this well-thumbed and incredibly worn tome provided many an answer to my researching and youthful mind while I was growing up and more recently as a source of fond recollections and profound nostalgia. Its one of those books you remember and treasure for so many odd reasons, and quite honestly I would be bereft without it. As a young boy one of the larger photos that captured my imagination was of the Common Octopus (Octopus vulgaris) and I distinctly recall a sense of unease at its sinister appearance, daring myself to open the page and gaze upon it, knowing full well it would play upon my mind later. I admit freely, that I do have a bit of a thing for old nautical titles and over the years, (yes you’ve already guessed) I have amassed quite a library of them. One of the authors, who very accurately captures the essence of my passion for this environment, is George Goldsmith Carter. His books on the fishing industry and coastal seamanship are some of the most nautically correct and wonderfully descriptive pieces of writing I have ever come across. My love affair with his work began when many years ago I read my Father’s copy of “Looming Lights” which charts his boyhood, growing up in coastal Suffolk (Aldeburgh),and his experiences of the local fisherman and knowledge of the seashore and local waters, culminating in his years spent at sea in the service of Trinity House, aboard some of the various light vessels stationed around the South coast during WWII. I adopted instantly, a huge affinity, for his work and still take incredible joy and satisfaction in picking up those elderly and so-loved memoirs. His other notable works include the titles: ” The Goodwin Sands “, “The Smacksmen” and “Red Charger”- the story of a trip taken aboard a Fleetwood steam trawler to the Haddock grounds off the North Norwegian (Andenes) coast in the late 1940’s. All hugely atmospheric and reminiscent of a time that has crept into my memories and endured purely because of the most formative times of my upbringing. His fascination with the Lightvessels I could relate to most personally, because, as a boy, lying on my bed on an early and foggy autumn morning, I could hear, so distinctly, the unholy and melancholy drone-and-thump of at least three different “Diaphone” foghorns from as many Lightships. A sound, I now realise, so beautiful in its unique tone, that the very thought and recollection of it will instantly bring me out in goose-bumps. If the wind was in the right direction, I could hear; the “Cork”- (one long blast of a slightly higher pitch), the “Sunk”- ( two drawn out deep baritone thumps) the “Shipwash” (three of the same) and right down in the Thames estuary, if the wind was from the Sou’eastard, the ” Barrow Deep” ( four blasts as I recall). I could only usually hear two at once but occasionally three, and my mind wandered to thinking of the ships that were out there, the hidden sands and wrecks and the other ever-present sub-surface dangers and hazards that lurked in the silty coastal gloom of the Southern North Sea. A fondly remembered era and a different time. I shall write more on the Lightvessels of Trinity House in future posts! Although I love nothing more than to enthuse wildly and reminisce vividly about my vintage library, I’m always on the lookout for second hand and pre-loved volumes that might appear. Only last week at a local Vintage and Antiques Fair I glimpsed a well worn dust jacket that bore all the hallmarks that I look for in a old book of that ilk. 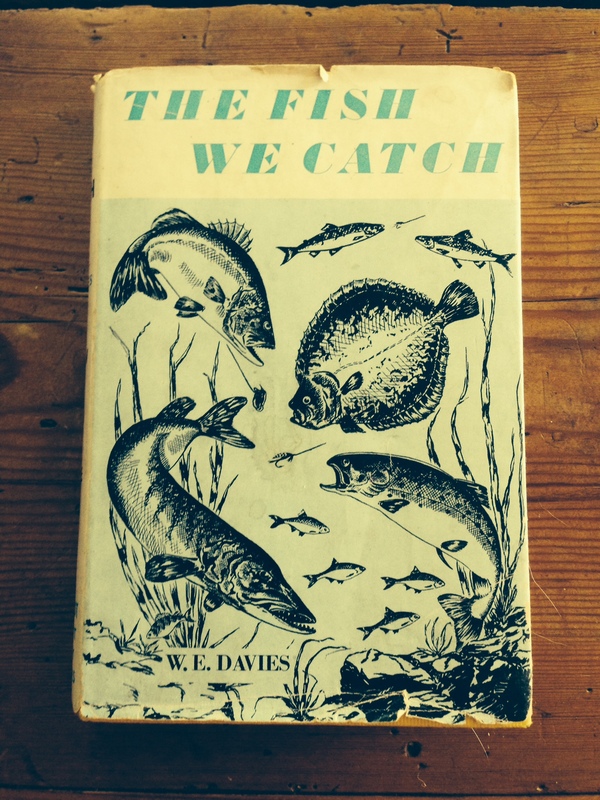 The simple black and white illustrations and beautifully succinct descriptions of fish (both salt and freshwater) and how best to catch them, speak of those heady days when I was myself first taking instruction. I hastily reached for some cash and with growing excitement obtained (for £5) yet another source of immense pleasure and informative nuggets that I can savour.